What Day Of The Week Was March 3, 1985? 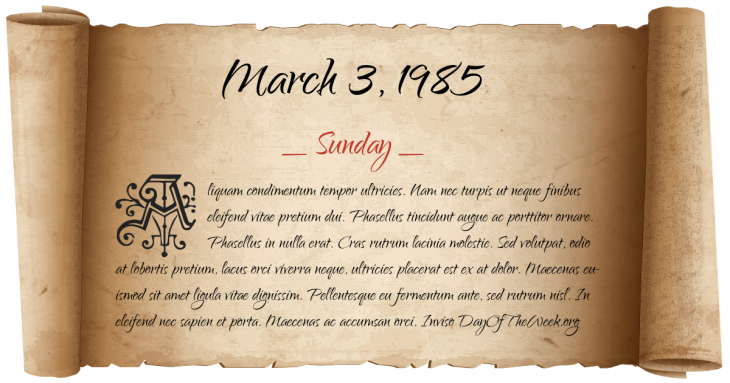 March 3, 1985 was the 62nd day of the year 1985 in the Gregorian calendar. There were 303 days remaining until the end of the year. The day of the week was Sunday. A person born on this day will be 34 years old today. If that same person saved a Half dollar every day starting at age 4, then by now that person has accumulated $5,503.00 today. A magnitude 8.3 earthquake struck the Valparaíso Region of Chile, killing 177 and leaving nearly a million people homeless. Who was born on March 3, 1985?